To our friends and family, miscellaneous musings after our first year in Italy. We arrived May 18, 2012. 1. Cats do not need to go outdoors. A windowsill will do. 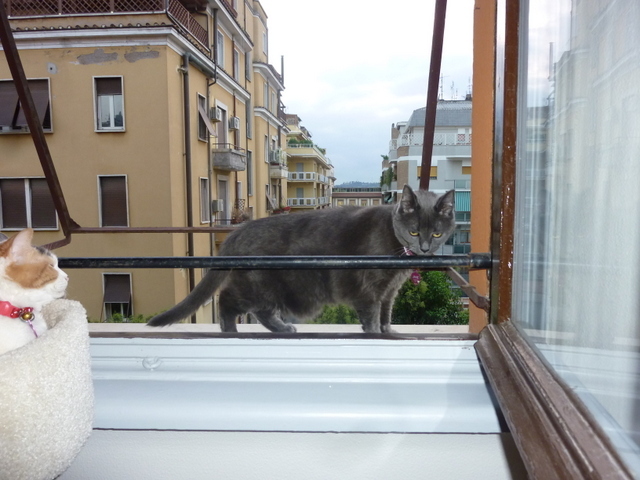 Dare-devil Janie on the (very wide) window sill. Libby watches from the cat tower. They traded a Portland garden for a 3rd floor windowsill. 2. When Italians ask “Come stai?” they really mean it. It’s not just in passing, like in the U.S. Here it is a conversation starter. 3. Arugula is fantastic on a sandwich piadina or panino. Lettuce is for salads. 4. A scarf around your neck is really comforting. It keeps the chill off your neck and it looks good, too. 5. Walking is a terrific form of transportation but shoe leather wears out faster than car tires. 6. Parking is colorful: white (free), blue (pay), yellow (restricted) zones are interpreted liberally by drivers. 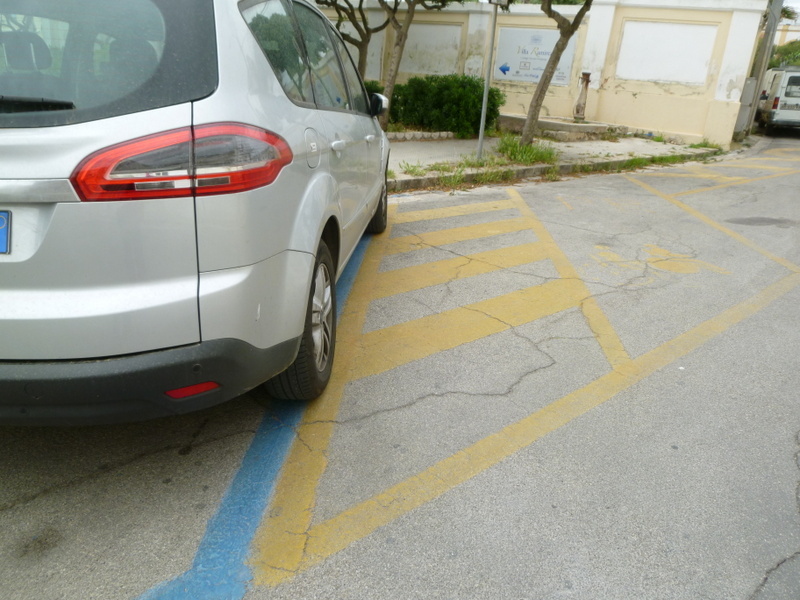 Here we see a car parked in blue stripes (pay) but overlapping onto yellow (reserved in this case for handicapped). 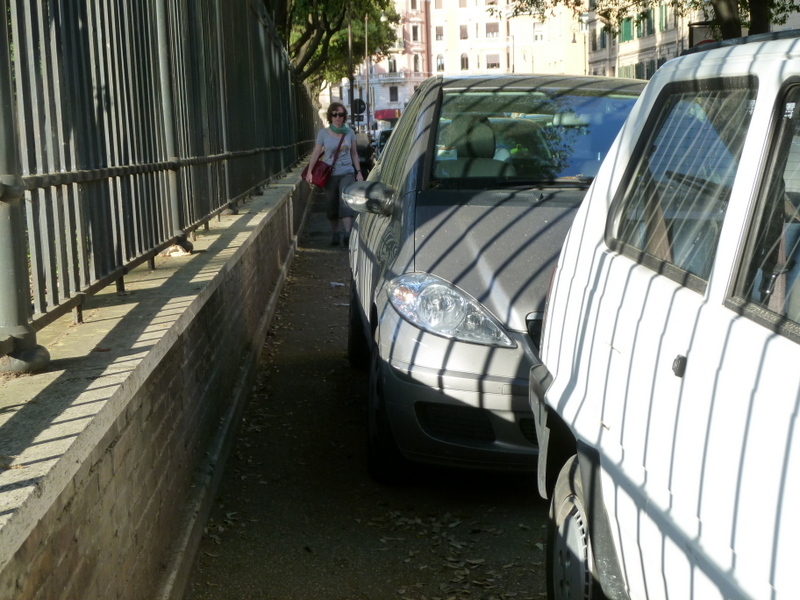 If there’s no room in the street, just block a sidewalk. 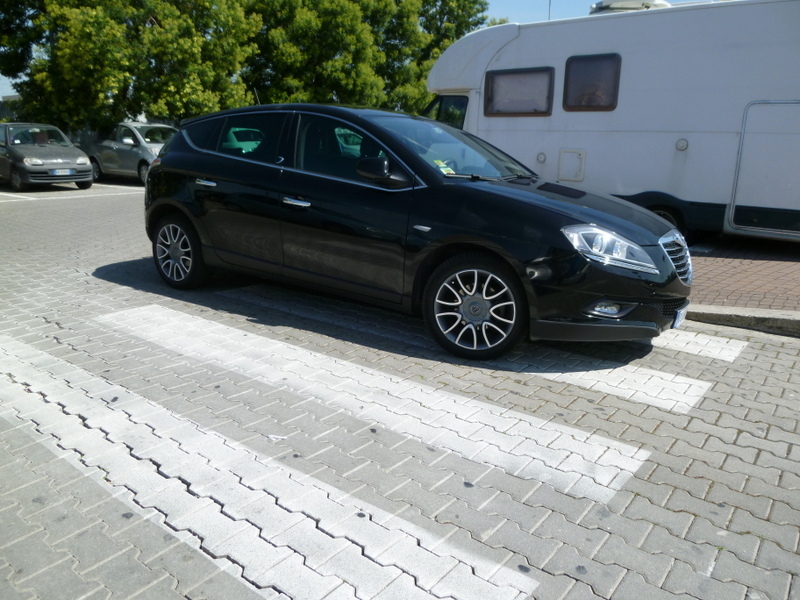 Pedestrians be damned! 8. Privacy is an American concept. 9. Dinner does not have to be a protein, a starch, and a vegetable. The American “square meal” is no longer a part of our lives. 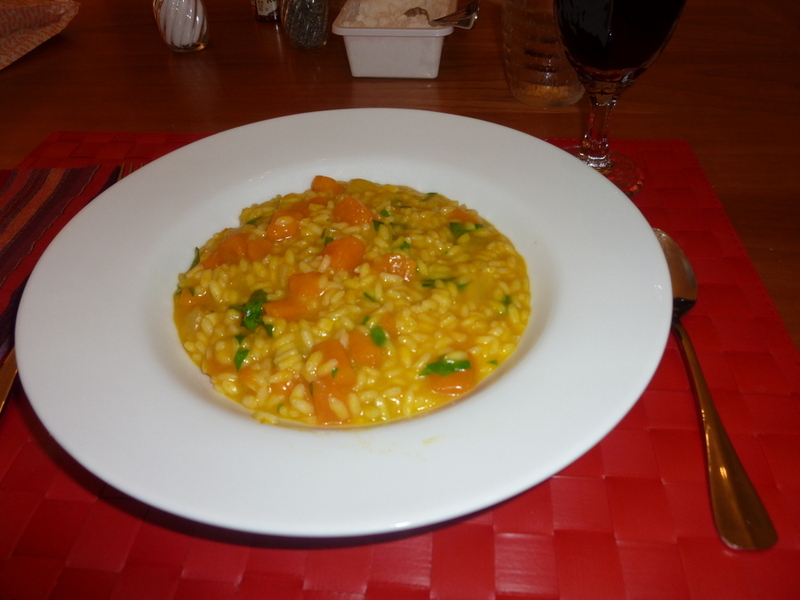 Pumpkin risotto – one dish meal, no meat, delicious local flavors. 10. Fresh flavors need little help. We have tossed out many of our spices. 11. Starbucks is NOT an Italian experience. No “Grande Americano” here: a single shot espresso gets us going in the morning. We have a few throughout the day. Pastries only on the weekends…or holidays…or vacation. 12. Being a repeat customer is heartily acknowledged. When was the last time your “regular” waiter greeted you with a kiss on the cheek? 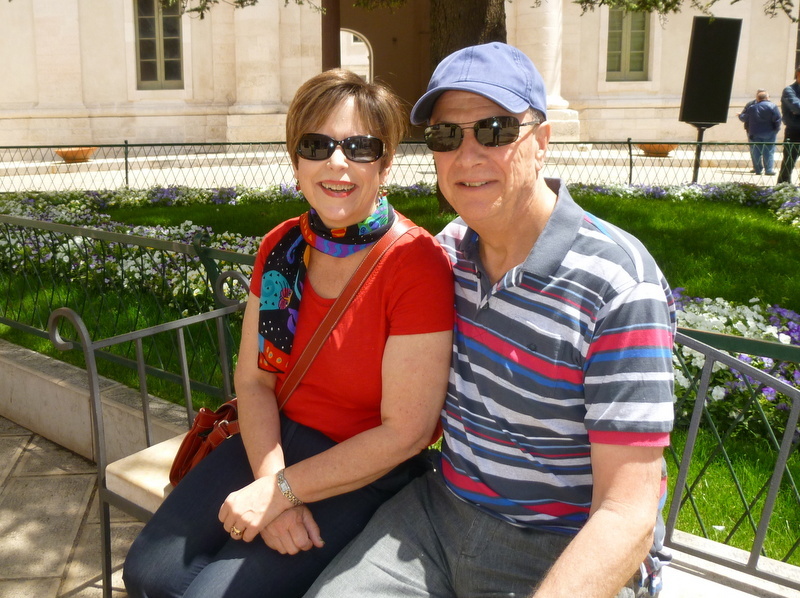 Celebrating one year in Italy, here we are in Martina Franca, Puglia. Hard to believe it has been a year. You two have accomplished so much and what a lovely adventure it has been. Indeed it continues to be an adventure! Hope your move plans are proceeding smoothly. Miss you and Mark! Happy one year to you both! Glad you are still lovin’ it. We are indeed loving it, Anita! It’s not all fun… we have to do mundane things too…but it is always interesting! Congrats Laurel and Ric! Also Laurel, thanks for your observations summary – what a wonderful experience you’re enjoying! Thanks Will! You’ve got to come back. We have new places to take you! Thank you Kym! We miss our friends in Portland and throughout North America, but we are still having “pinch me” moments here in Italy. Thank you for reading. More to come…. CONGRATULATIONS on your one year anniversary in Bella Roma! It sounds like you’ve settled into your new lifestyle very well. It sure doesn’t seem like it’s been a year. 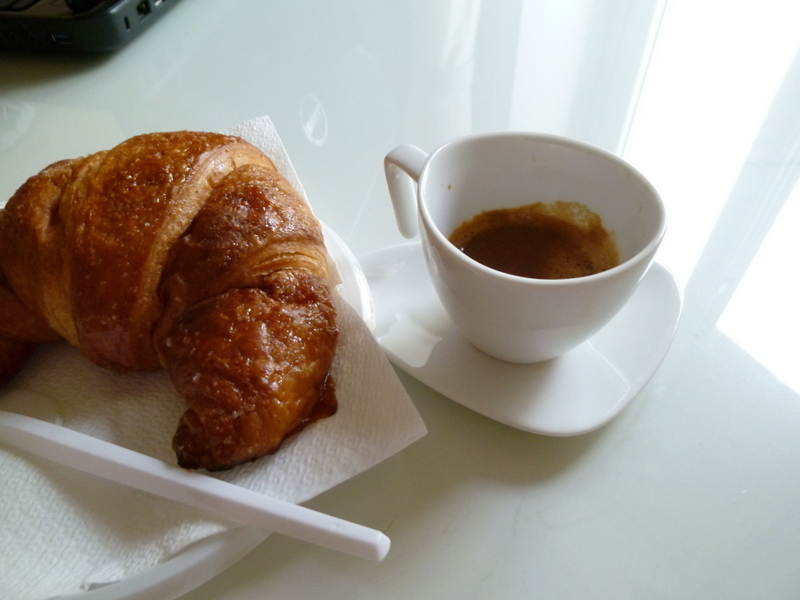 I also had to make a change in my dining habits when visiting Italy. Having a meal with all the food groups can be an expensive proposition (and usually more than I can finish), so I tend to order something like you mentioned. Although it’s not the “lightest” on calories, one of my usual favourites is Pasta all Carbonara, along with Insalata Mista (that somewhat covers all the bases). Best of wishes for the next year! Ciao Mary! Thanks for your comments! I would love to see you but that is about two years away. 🙂 Take care, say “hi” to the gang at Sugar and give Daisy a pat for me. Thank you Carolyn! We love your zoo news, too! I muse (and am amused) every day in this marvelous land. We are so privileged to be here!